Nabilah is the little sister figure in both JKT48 and literally in her family. While JKT48 having younger members nowadays, she’s still the little sister to most people. It took her 18,217 KM (Roughly 11,000 Miles) to find the little sister figure she never had, in New York. Nabilah was there for shooting scenes for her up and coming movie when she met a 7 year old girl named Tesa. There’s a place for kids diagnosed with cancer near the place where the movie is shot. I met lots of them, and one of those kids is her, 7 y.o Tesa. I get to know her when she came to me cheerfully and converse with me. She’s so cute. She followed me everywhere I go, she held my hand, she hugged me. I’m so happy that I get to meet the little sister that I never had, her. But on the other hand, I’m upset. 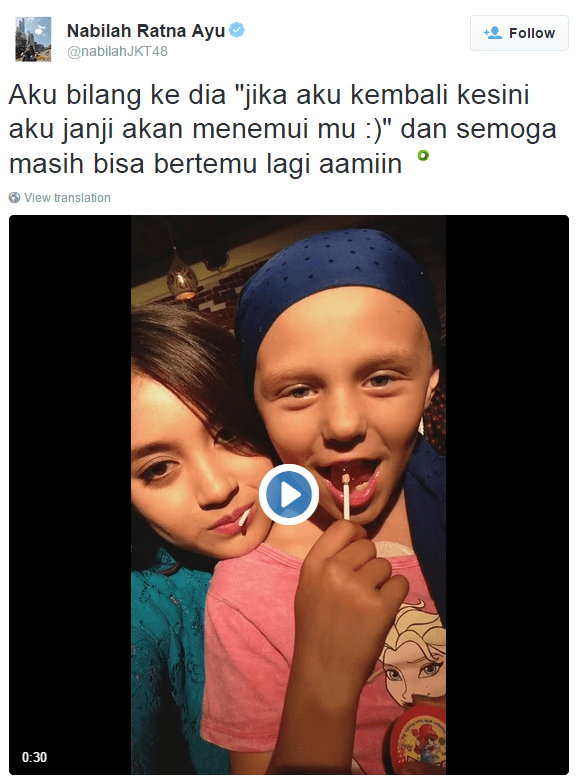 Why innocent kids like her has to struggle with Stadium IV bone cancer? I talked with her father and he was upset too when she was diagnosed with cancer. And well…she really is cheerful I’m so happy that I get to meet my little sister, I learned a lot from her. I told her, “If I ever back here again, I promise I’ll meet you,” and I really hope that we can meet again, amen. Friendship is a beautiful thing and may God bless the both of them.